1.Fashion has seen unprecedented growth in India. With so many students opting for the course, what is the main career option they choose from among the so many that this course provides? Today Fashion Designing and Technology is an established branch of human knowledge, science and practice. It provides employment and business to millions of people throughout the world and there has been a huge investment in fashion industry. Expert fashion designers, technologists, stylists are busy day and night to cater to the needs of the fashion conscious people of the society. They not only cater to the taste of the people but also create fashion thereby earn huge profit. In India fashion industry is now booming. Clothing (fashion) industry is one of the biggest industries in the world (1.7 trillion dollar industry) hence it has an immense potential for providing job opportunities. There are many career options available after pursuing the course, it is completely the discretion of the students which field they want to endeavor in and excel, as all the opportunities are lucrative. Some of them are Listed Below. · Entrepreneurs and form their own company. 2. As a distinguished faculty, share your views on what attracts the young generation to opt for this course in these times of glamour and glitz. Fashion has spread in all the spheres of our life. Fashion designing is a lucrative profession. Fashion shows are held to exhibit the latest dresses. Dresses are designed to fit in every occasion of life. Fashion instills confidence in the mind of the youngster. Youngsters always try to present themselves in the most attractive dress appropriate for an occasion. It helps them to look more smart, attractive, stylish and presentable which boosts their confidence level. Fashion also reflects progress and growth of civilization. It is a mark of social progress, prosperity. The Industry is full of diverse opportunities and glamour, it allows you to be creative and innovate hence, more and more youngster look up to fashion designing as a rewarding career option. 3. 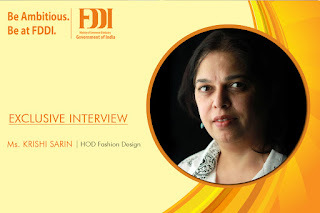 What is the hallmark of the fashion designcourse at FDDI? FDDI has emerged as one of India’s leading centers for Fashion Design, a reputation based around its pedagogy and achievements of its graduates and the creative energy of its staff and students. Students are encouraged to take internships and gain as much real-world experience while studying at FDDI. Our students are working in Large-Export house like Shahi Exports , to high-end designers like J.J Valaya, BODICE, Gaurav Gupta , Sulakshna Monga , our graduates are sought after because they hit the ground running and have the talent, knowledge and experience needed to rise quickly. 4. Designer clothes are now mostly affordable. Do you think it impacts the business of upcoming designers? No with coming up of design councils like FDCI etc it becomes easy for the new budding designers to show case their caliber. Though high end designer clothes are still not affordable, but there has been change in the taste of the people and hence they don’t mind paying little bit extra money to own designer wear. Further as not everyone can afford to buy the high end designer wear and hence they buy designer wear which is mass produced by designer branded companies. Thus upcoming designers have more opportunities. 5. To become a successful fashion designer, what are the most important things that a student needs to learn and understand? 1. Develop his skills. Successful fashion designers needs a wide array of skills, including drawing, an eye for color and texture, an ability to visualize concepts in three dimensions, and the mechanical skills involved in sewing and cutting all types of fabrics. 2. Decide which designing field is his principal interest. You may need to start at the bottom but you do need to have a goal in mind as to the type of designing you want to undertake eventually. Are you interested most in haute couture, ready-to-wear, fitness/leisure gear, the mass market or niches such as eco wear? 3. Know about the business side of fashion. Being a successful fashion designer not only requires talent and creativity, it also requires a sound knowledge of the business and marketing aspects of the fashion world. Keep yourself updated on the happenings in the fashion industry. 5. Be innovative and passionate about his work. As that’s the key for success. FDDI was made under the aegis of the Ministry of Commerce & Industry, Government of India, is evaluated amongst the chief calfskin items, footwear, form, outline and retail foundation on the planet & has created its foot shaped impressions worldwide by assuming a spearheading part in upgrading the ability, competency and execution of the businesses comprehensively. With the goal of skilling the adolescent with an accentuation on employability and business visionary aptitudes, FDDI has concurred most extreme need to advancing 'Ability Development' to course the aptitude hole for the development of the Footwear, Leather and Allied Sector and is instrumental as an 'One Stop Solution Provider'.